“My grandfather, Laibel Mintzberg, is the leader of a large community and a greatly respected Torah scholar. He has many followers, and will sometimes hint that he is Meshiach. I used to idolize him as a boy. 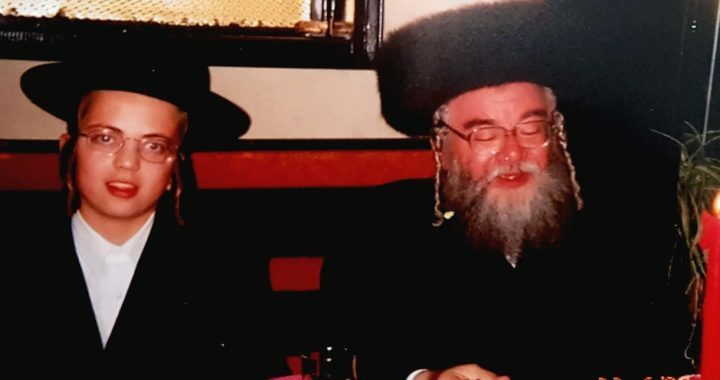 When the time came for me to begin studying at a Yeshiva Gdola, he asked me to study at his Yeshiva, instead of the one I had already signed up for. He told me that I should receive “our” education. Shortly after beginning my studies at his Yeshiva, I moved in with him. “One night while I was in bed, I heard footsteps, and then heavy breathing in my room. It was my grandfather, arched over me and touching me. He pulled off my blanket and pulled down my pants and underwear, did as he pleased, and then dressed me again and covered me in the blanket. This routine was repeated night after night, dozens of times. I would freeze, not moving a muscle, waiting for him to leave. “He abused me when my cousins stayed at his house and I slept in the living room. One time, someone called for him while he was in my room. He hurriedly dressed me and left. Once, I spent Shabbat with him in the community in Beit Shemesh. I remember in his Drasha after dinner how he spoke about “feeling the holiness of Shabbat.” Later that night, he felt me. “In the mornings, I felt distressed and agitated. I decided to tell my close friend, and swore him to secrecy. He told. Everyone knew about it, including my family members, who were shocked by what they heard. I denied everything and continued to be active in the community. I published some pamphlets, including ones with my grandfather’s teachings. “The story wouldn’t go away and I wanted to put it behind me. I didn’t complain because I was in a closed Haredi community and thought it was wrong, but I had to do something. So I confronted my grandfather and told him I thought he should stop working with children. He told me I had dreamt it. “He hadn’t taken me seriously, so I wrote him a letter and sent him the results of a polygraph test I had taken. I hoped he would take responsibility for his actions and apologize to me. But instead, he attacked me, called me evil and corrupt, and told me to mind my own business. That was the last time I saw him. “A few days later, one of his students called me and asked me to apologize to my grandfather. “What do I need to apologize for?” I asked. “I don’t know,” he said, “but your grandfather is very hurt and you should apologize immediately,” I said if he wanted me to apologize, he would have to explain what for. “My grandfather distributed flyers in the community pressuring me to apologize, but I didn’t give in. So I was excommunicated, along with my immediate family and anyone else in the community who believed me. Some Rabbis from the community resigned their positions in the organization, including the head of the Yeshiva. My grandfather hired new Rabbis and changed the name of the Yeshiva. He completely isolated us from the community, and some found signs posted on their doors at night reading “Here lives a traitor”. Some of his students threw eggs at my father’s Kolel. “Things have been like this for several years now. My family is torn apart. My cousins didn’t attend my siblings’ weddings, out of fear of my grandfather. He banned them from doing so. My immediate family is very supportive of me, though they don’t like to bring up what happened. It’s embarrassing for them and hard to talk about. I understand them and love them very much. “Last year, I finally mustered the courage to go to the Police. After my grandfather was questioned, I was told that the case had been closed due to a lack of evidence. But he and I both know exactly what happened, and as he taught me, the truth is more important than anything. “So dear grandfather, Meshiach you are not. You are a subpar grandfather with serious problems. You hurt me. I want to believe that you didn’t abuse anyone else, but you probably did. I saw you brush your hand over a waiter’s back at a wedding when he bent over and his shirt came untucked. And everyone in the community knows the story of how decades back you appeared before a Beit Din because a student of yours “tried to frame you.” Somehow, that story went away. “It’s a shame you haven’t sought treatment. You are a great scholar, full of wonderful insights about the Torah, and full of flaws as well. I’m at peace with who I am. It’s a shame that you have chosen to wage a cruel, childish, and stupid war against hundreds of your students, including your own children and grandchildren. As if it will change what you did. I dream that you might one day take responsibility for what you did, apologize, and work to fix yourself. “And to the community, be alert and don’t turn a blind eye to abuse. There’s no reason why anyone would fabricate a story about being abused. Would you? No, certainly not about a close family member. If someone comes forward with a story like this, the only reason is because it happened. The above text is a free translation and was condensed.